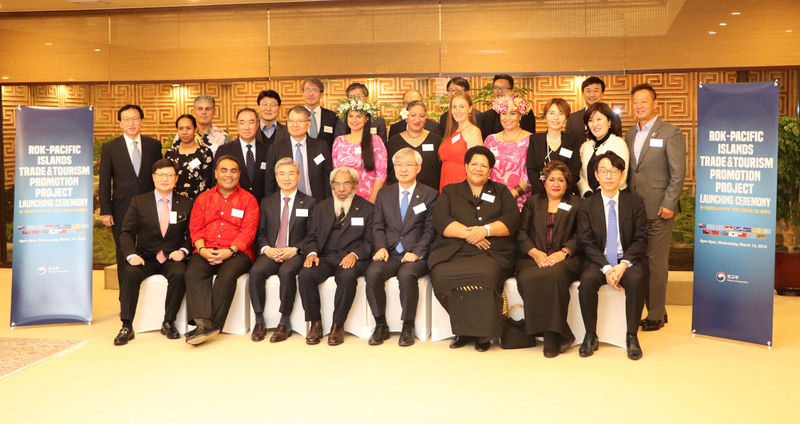 Fiji’s Ambassador to Korea, H.E Peniana Lalabalavu recently opened a networking session on the margins of the “Meet the Pacific” event, organised by the South Pacific Tourism Organisation in Korea. The event aimed to strengthen the networking of tourism stakeholders and introduce their area of work within the Pacific to the Korean tourism industry. 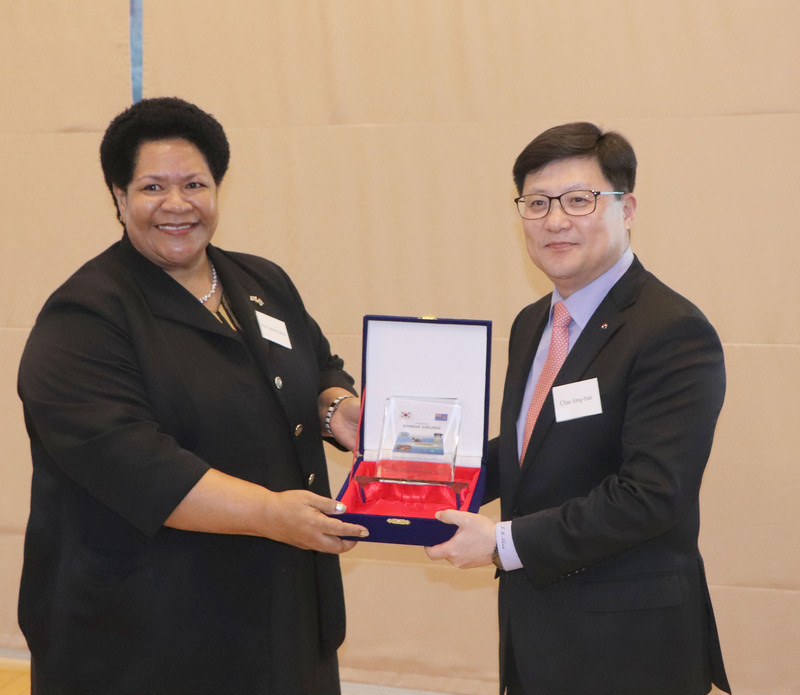 Ambassador Lalabalavu at the event presented a plaque of appreciation to Korean Airlines (KAL) for their direct flight service to Fiji since 2005. Currently, Korean Air operates three (3) flights per week to Fiji, which provides access to other Pacific Islands. The award was accepted by Mr. Chae Jong Hun, Managing Vice-President of the Regional Headquarters of Korean Air on behalf of Korean Airlines. The Vice President shared how deeply honored Korean Air was to be recognised and appreciated through the award. 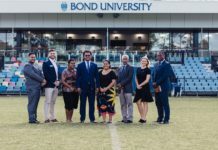 The event also included a performance by Korean youth volunteers from the International Youth Fellowship (IYF) who had visited Fiji and Pacific. Meanwhile, the Ministry of Foreign Affairs of the Republic of Korea in partnership with the Pacific Islands Countries launched the “Republic of Korea-Pacific Islands Trade and Tourism Promotion Project (TTPP). The event was hosted by Honorable Lee Tae-ho, Vice-Minister for Foreign Affairs of the Republic of Korea, in Seoul at the Official Residence of the Honorable Minister for Foreign Affairs of the Republic of Korea. 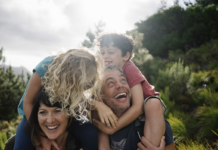 The project is the first of its kind to be supported by the ROK under the “Republic of Korea-Pacific Islands Countries (ROK-PICs) Cooperation”, in its effort to promote more structured and long-term trade and tourism promotional activity for the Pacific region as a whole. In his opening address at the launch, Vice-Minister Lee expressed hope that the Project would help to enormously boost people-to-people links and advance diplomatic collaboration. In this regard, he urged South Pacific Tourism Organization (SPTO) to contribute further efforts to promote trade and tourism between the ROK and the PICs. The Project will be implemented over the next two years and is expected to pave the way for enhanced cooperation and boost sustainable economic development for the two sides. 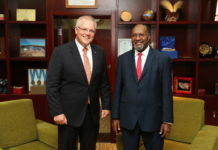 The launch was attended by Government officials from ROK, members of the diplomatic corp and business community, hotel and tour operators from the Pacific region, and so forth.